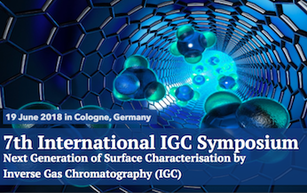 We are organizing public events like the International IGC Symposium (see below) and we also offer inhouse events of different analytical methods so that it is easy for you and your colleagues to learn more about new analytical techniques. Feel free to contact us for an inhouse presentation. This year's symposium focuses on effective and valuable surface characterization of powders and fibres and other materials based on the dynamic adsorption of up to 20 different gas probes, also known as Inverse Gas Chromatography (IGC). Participants will understand the potential of surface characterization by molecular probes, the pitfalls of different practices and the practical use for the different applications in industry. Good practices as well as critical aspects and supporting techniques will be outlined. And structured discussions will intensify the exchange of experiences – like in the successful 2018 symposium. The one-day program is compact and ideally suited for industry representatives from R&D, product development and analytical departments as well as researchers from institutes. Ralf Duempelmann pitched for the second time at the 2nd European Chemistry Partnering Event. Last year it was a great opportunity to present our analytical services and to connect with many different experts from the chemical industry. ​This year ECP had 850 participants with a comparable industrial quota. The well organized 1:1 meetings were a great opportunity to connect with new potential customers and partners. At the Porotec Workshop Ralf Duempelmann presented for the third time results and best practices of IGC measurements and highlighted the new automated instrument for Inverse Gas Chromatography. This symposium showcased experts who all use dynamic sorption methods also known as inverse gas and liquid chromatography (IGC, ILC). In IGC the adsorption behavior of 15-25 different probe compounds is used like AFM tips to characterise the properties. ​The program presented the latest, most up-to-date knowledge and experience on surface characterisation of powders and fibres. Good practices as well as critical aspects and supporting techniques were outlined (see abstracts). Structured discussions intensified the exchange of experiences – like in the successful 2017 symposium. The one-day program was compact and ideally suited for industry representatives from R&D, product development and analytical departments as well as researchers from institutes. We participated and pitched at the European Chemistry Partnering Event on 23 February 2018 in Frankfurt, Germany. ​It was a great event with more than 300 participants. A great opportunity to network and make contacts in the chemistry industry. On 20 June 2017 eight different speakers from Germany, France, Switzerland, Portugal and Poland presented their best practices on diverse aspects of inverse gas (IGC) and inverse liquid chromatography (ILC). You find more details about the speakers and abstracts on the special website of the symposium. This year we also offered an overview about IGC in a workshop before the symposium that was well received. At the special conference for the 50th anniversary of the Hansen Solubility parameters, Dr. Ralf Duempelmann presented: "Recent advances in Inverse Gas Chromatography - IGC - measurements of HSP" (instead of Eric Brendle who is indicated in the presentation). On the 8th November 2016 Dr. Ralf Dümpelmann presented for the second time at the bi-annual Porotec Workshop in Bad Soden. It was already the 18th workshop of Porotec under the topic: "From nanoparticel to monolith". The 5th IGC Symposium took place on the 14 June 2016 in Munich. The 4th International IGC Symposium took place in Basel on 9 June 2015. At the Technologiepark Hoechst we presented for former colleagues and partners the story of Inolytix and provided brief insights into surface analytical tools as ToF-SIMS, XPS and iGC together with our partner Nanoanalytics. The feedback was great and we are looking forward to future inhouse events for further methods of our portfolio. 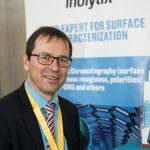 At 17th event of Porotec about 'Modification of Porous Solids' our CEO Ralf Dümpelmann presented Inverse Gas Chromatography and Inverse Liquid Chromatography with practical application for road building stones. The 2014 conference was held on 4 & 5 September 2014 at the Zurich University of Applied Sciences, Wädenswil, Switzerland. The meeting provided an interdisciplinary discussion forum for experts in the field of (bio)process analytics and sensor technology. Together with our new partner 3T analytik we presented QCM Quartz Crystal Microbalance there.